Sunday’s controversial playoff match at BMO Field was likely the most entertaining 1-0 loss ever witnessed by Toronto FC fans. In a match filled with bad blood and controversy, TFC did enough to advance to the Eastern Conference Final by virtue of scoring more away goals than the New York Red Bulls in their two-leg aggregate series. Much of the entertainment came between the whistles, and even between the halves. 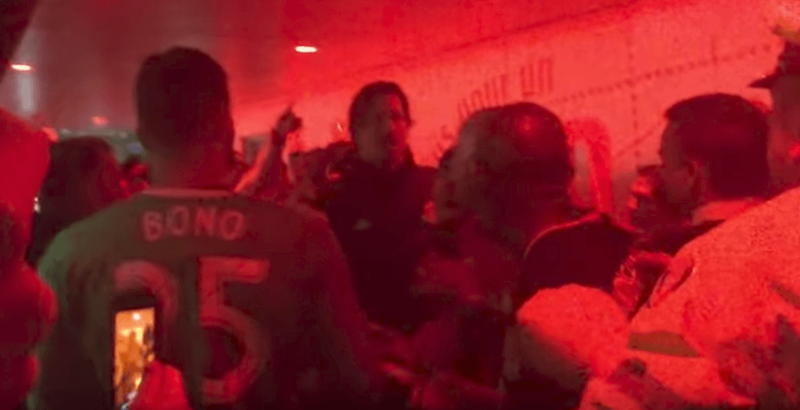 Bad blood between Toronto’s Jozy Altidore and New York’s Sacha Kljestan spilled over into the tunnel at halftime. Both players were ejected from the game, receiving red cards. It’s unclear who started the altercation, which took place near Toronto’s dressing room, with both teams predictably blaming the other. “I just have witness accounts and we are working on the video of what happened, but Jozy was followed in, basically confronted and he turned around and from my understanding the next thing you know there were four, five or six Red Bulls people all rushing towards him at the same time and the rest we’ll see,” TFC head coach Greg Vanney said following the match. Altidore didn’t speak to reporters at BMO Field, but attended a Toronto Raptors game later that evening where he spoke to TSN’s Rod Black. The incident happened in front of fans, some of who were able to capture the melee on video. The first video is the only one that captures Altidore, as it looked like he was removed from the situation early. @jozyaltidore having none of it. TFC has appealed Altidore’s suspension in the hopes that he can play the first leg of the Eastern Conference Final against Columbus on November 21. Toronto could be without two of their star players for that match, as Sebastian Giovinco has also been suspended for yellow card accumulation.